Our sippy cup lids are made of high quality BPA free silicone and fit well over most cup sizes (2"- 3.15" Diameter). They are easy to clean, dishwasher & boil safe. No need to carry bulky heavy bottles as our lids make most cups spill proof in minutes. Turns your cup into a sippy (cups not included). Stretches over most cup sizes (2 - 3.15 inches diameter). Wash thoroughly before initial use and after each use. Wash each piece separately. Dishwasher-safe or hand wash in warm, soapy water. Do not microwave. Can be boiled or sterilized. If you touch the lid once it's on, liquid will shoot out from the straw, because no air inside the cup and our lids air mouth is too small. If you press on the air month, the liquid will spill out from the straw too. 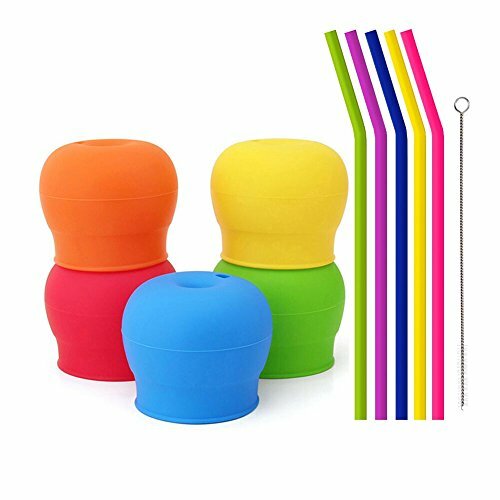 To solve it, you can choose to cut the air mouth a little large, but if you reverse the cup, the liquid will leak, it's one thing two sides, if you use this kind of silicone cup lids, any straws on it will meet this issues, if you mind, we are not advise you buy. 100% BPA FREE SILICONE LIDS, Toxic Free, Safe, Spill-proof, Dishwasher-safe. Turn any cup into a sippy. If you have any questions about this product by TOUGS, contact us by completing and submitting the form below. If you are looking for a specif part number, please include it with your message.